For a change from processor boards, let me tell you about my new WATCH. For a long time I’ve been a faithful Pebble user, the watch has a week’s battery life, a display you can read in sunlight and a host of applications. I had one of the very originals which sadly did not survive a swimming expedition in a saltwater hotel pool and the guys at Pebble replaced it without question. However things move on and I was sitting with a neighbour perhaps 3 weeks ago now and I notice his wrist hovering as if to say “you need this, Peter”. He flicked his wrist and the most wonderful Tag Heuer display popped up. a beer later and he showed me the watch again – this time with a Gucci watch face. I could bear it no longer. 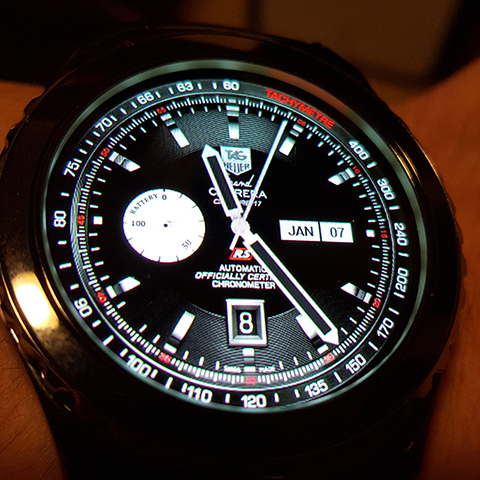 So, several days later my Gear S2 Classic turned up. It is a work of art, to put it mildly. I’ll get the bad bit out of the way first – the battery lasts 2-3 days – but the good part of that is the proximity charger, another work of art you just drape the watch over with no connection to charge – in VERY little time, less than an hour and it’s ready to go. This alone with the pictures should be enough to make you get your wallet out – but then I remembered I have TASKER on my mobile phone (HTC ONE M8) – and that talks to MQTT. Could I be so lucky? YES – there’s an APP for that. A small add-on APP for the watch lets me scroll through all my Tasker tasks and run them at a touch. If you’ve used tasker – you’ll know you can do just about anything with it – including (with an add-on) send MQTT messages. If you, like me, have no artistic skills then you can create your own watch-face in no time at all like the one I’ve shown on the right – done right in Mr Time Maker’s web page – but if you have a little skill you can make a DAMNED good emulation of just about any watch on the planet. Just as an aide the watch has technology underneath to do your pulse rate and there is also the usual health stuff like how many steps you’ve taken, weather locally, news, alerts etc.. the list is endless and growing by the minute. So now not only do I have a black-leather-strapped work of art attached to my wrist (you really DO have to see the display – which, depending on watch face (and there are many hundreds of them thanks to Mr Time Maker app) can be seen in reasonably bright (Spanish) sunshine, but also I can control all my household gadgets in comfort. The links in the above article should help you. Enjoy. If interested do check pricing though for the watch. It varies dramatically. I need to stop reading your posts!. Cancelled my Pebble Time 2 preorder and now have a Gear 2 Classic!. Hah... trust me you'll love it. Ok it does not have the battery life of the Pebble - but it looks WONDERFUL. It also has the pulse rate sensor on the back which is nice. Oh, and yes, it is bright. I've read that some folk have received ASIA versions of the watch from other sellers. I hope this one is OK. I don't think you'll regret it, guys - I'm loving my S2. Got it controlling lights now.